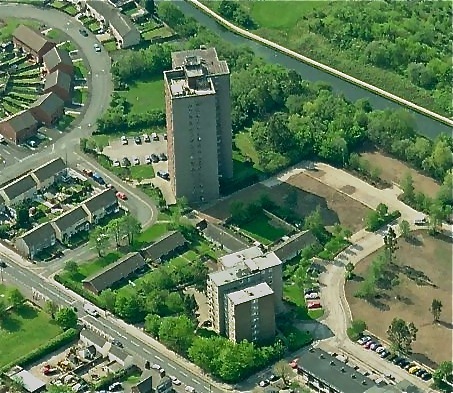 Way back in the early days of this blog, I covered the thorny issue relating to the condition of Humphries House, Brownhills’ last remaining large tower block. In the original post, I highlighted the fact that the fabric of the building seems to be in a very poor condition, and that the owners, Walsall Housing Group (WHG), seemed reluctant to act to remedy the issues raised by it’s long-suffering tenants. There was some talk from the housing provider at the time that Humphries House was to undergo a program of refurbishment, but there are still no references to that end on their website and in fact, there is no reference to that block, or the smaller Severn House complex nearby, anywhere on their site. Some weeks ago I noticed that scaffolding had been erected against one side of Severn House. Severn House is an odd, truncated structure of eight floors built using the same discredited system building method as the three major Brownhills towers, but much slimmer, and is given over to housing older residents. Taking the opportunity to ask, I enquired with workmen what was being done. It seems that core samples were being taken to establish the condition of components that constitute the main fabric of the buildings, both inside and out. The tests apparently concerned the concrete facing panels and metal joints interlocking them together. Further enquiries suggest that WHG have been in contact with tenants, looking for volunteers to allow technicians to drill from within their flats, to enable a fuller assessment of the structure’s condition to be evaluated. WHG would compensate those concerned with vouchers for decorating materials to make good any damage caused. People living within both Humphries and Severn House are concerned about the condition of their homes and what the implications are for their future. This has not been helped by the feeling amongst residents that WHG’s talk about the potential refurbishment has all but ceased, and the tone of any discourse on the matter with them has changed to if, rather than when, the blocks may be refurbished. To this end, the residents have involved their councillor, Barbara Cassidy, who has been doing stirling work on their behalf, but the uncertainty about their future remains. Walsall Housing Group owe it to their tenants to come clean about their intentions for these flats, as in the information vacuum that results from their silence, rumour grows. It cannot have escaped many observers attention that whilst Waine House and Bailey House were considered appropriate candidates for the crusher, little has happened to improve the lot of those dwelling in Humphries or Severn Houses since the demolition of their sister towers. As there seems to be little structural difference between them, one wonders if there can be any viability in these remaining prefabricated edifices when so much money would have to be spent to bring them into a satisfactory condition. In light of the fact that Walsall’s largest social housing provider seems to be able to afford the exorbitant 6.5 million pound price of a new headquarters in Walsall Council’s planned Gigaport development, one would hope that they could find the resources to keep the residents of some of their most dilapidated residences informed about their condition. Judging on past performance, I’ll not hold my breath. This entry was posted in Brownhills stuff, Environment, Followups, It makes me mad!, Just plain daft, Local politics, planning, Shared media, Walsall Council and tagged Bailey House, Brownhills, Cheap tat, Humphries House, Local politics, planning, Redevelopment, refurbishment, Severn House, Waine House, Walsall, Walsall Council, Walsall Housing Group, Walsall politics. Bookmark the permalink.